One Saturday morning recently, I was walking down Brick Lane when I saw a long line of hundreds of excited young people that stretched the entire length of Sclater St. When the Thrift Store decided to post an invitation to their jumble sale on facebook, they never dreamed that over two and a half thousand people would arrive, many coming from as far away as Oxfordshire and Cambridgeshire. 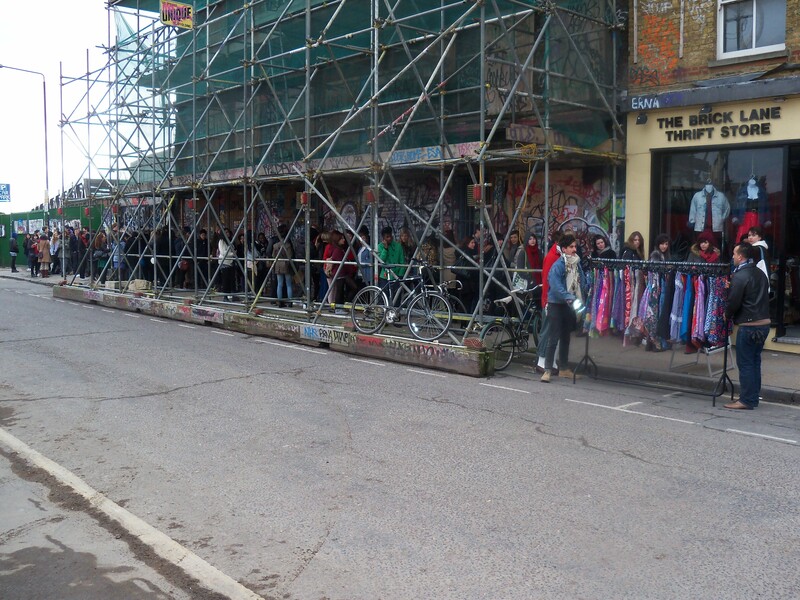 At opening time there was already a queue of four hundred people waiting outside but during the morning it grew and grew, until the line reached all the way round the corner into Brick Lane. You have to admit it was a good deal, for £10 you could fill a small bag with as many clothes as you pleased or for £20 you could fill a big bag. 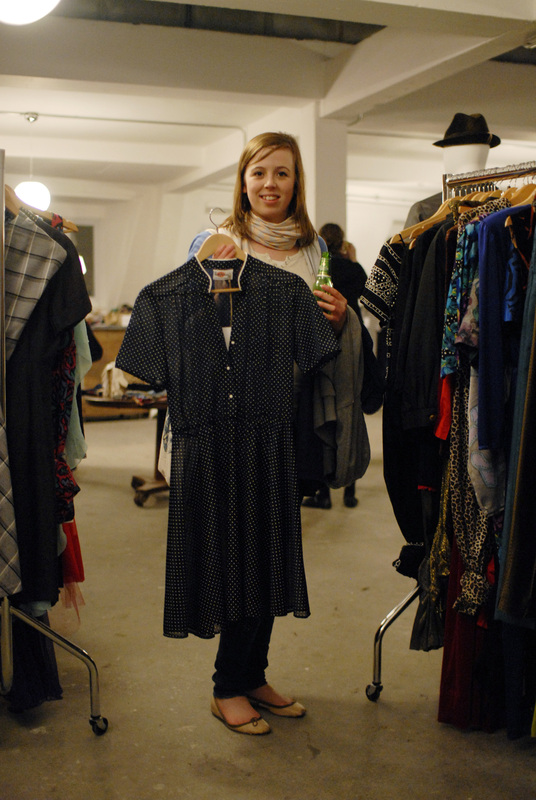 There are so many reasons to love thrifting but I had no idea the culture of secondhand was this huge – until I saw the line of enthusiasts in Sclater St, all dressed in their diverse individual styles created from vintage. Spitalfields is now the capital of this culture and thousands of eager people come every weekend from all over, to trawl through the different thrift stores side by side on Brick Lane, Cheshire St and Sclater St. Taking the occasional break for coffee or lunch, and meeting up with friends along the way, it is a pleasant day’s occupation. I see them parade back to Liverpool St clutching their bags triumphantly at the end of the afternoon. Quite simply, vintage clothes have brought the fun and creativity back to fashion because they are cheap and every item is unique. With tantalising ambiguity, these clothes manage to be both democratic and exclusive simultaneously, permitting everyone to create a distinctive look, expressive of their personal identity, that no-one else has or can have. And the alterations that are often required invite the purchaser to restyle the garments, using second-hand to become fashion-forward. Another attraction is that old clothes often display higher quality workmanship and are manufactured from better fabric than many new clothes. I love the poetry of old clothes that carry their history, of design, of manufacture, of the previous owner, and of other times and other worlds. There is a fascinating dynamic present when a younger generation take on the garments of a previous generation, subtling adjusting them to the suit the requirements and expectations of contemporary life. We wear them differently. In their form and structure, these clothes connect the wearer to the social custom of the past while revealing how the world has changed too. For those politically aware fashionistas, wearing secondhand clothes is an ethical statement in itself, and one of the best kinds of recycling, providing the easiest path to the moral high ground that I know. Because you are conserving the resources that would be used to make new clothes and also dissociating yourself from the exploitative labour practices of the High St stores. Imagine, all this integrity that can be acquired just by purchasing some old rag! Poppy is thinking about whether to buy this silver hat for £10. Duke knows how to look good in primary coloured sweaters. This is Nimi and Tina, showing off the snazzy red dress she discovered for £15. 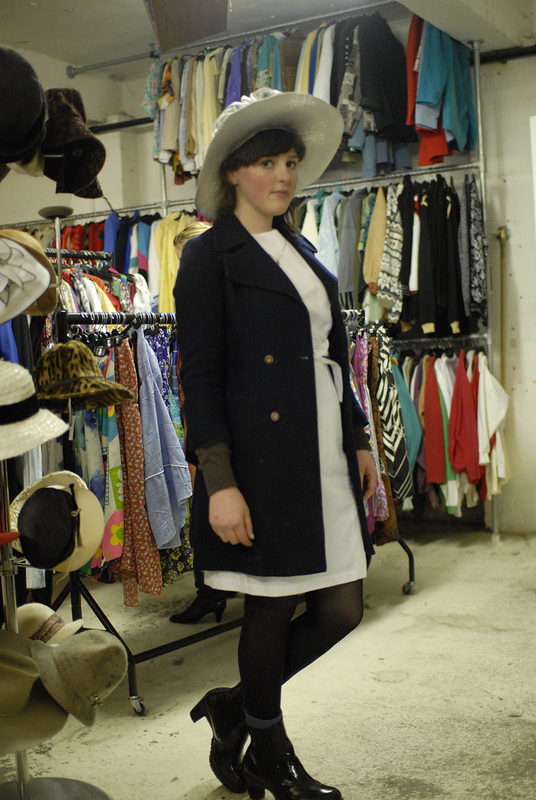 This is Jen, triumphant with the classic shirtdress she found for £30. 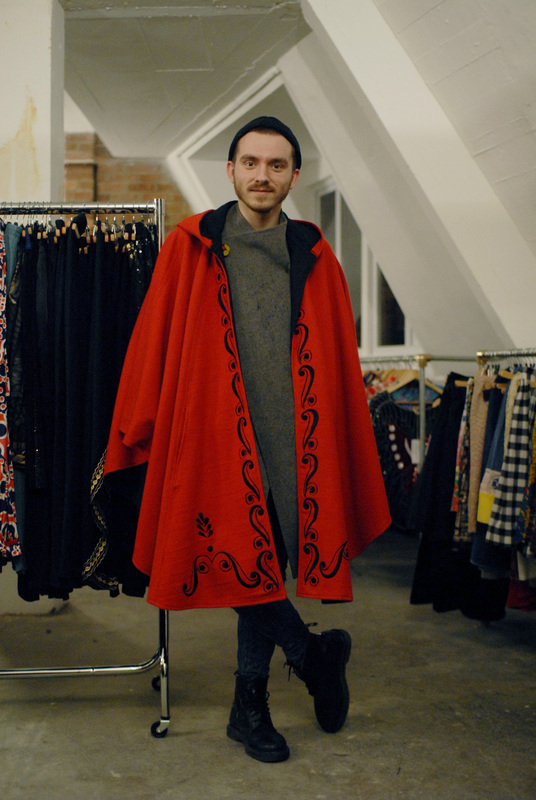 This is Rafal who knows instinctively how to carry off a cape. This is Nina delighted with the nautical-themed shiftdress she will wear all summer long. 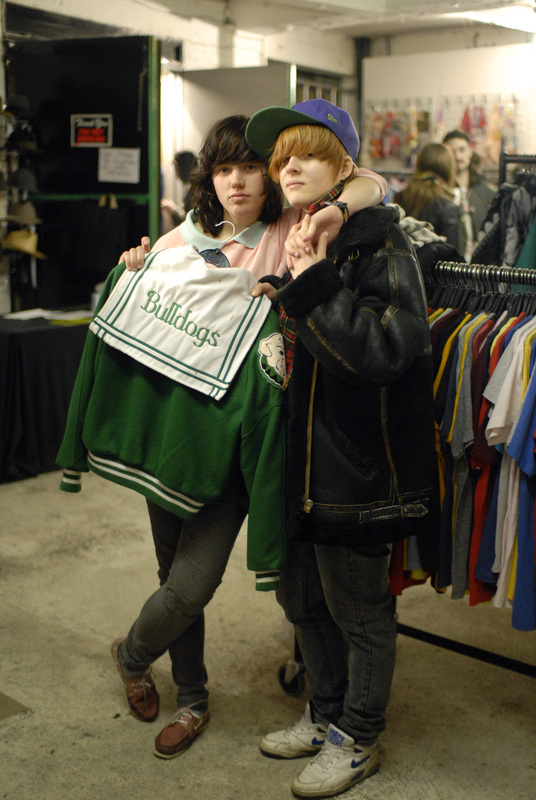 This is Paula and Ainara who are going to share this jacket. 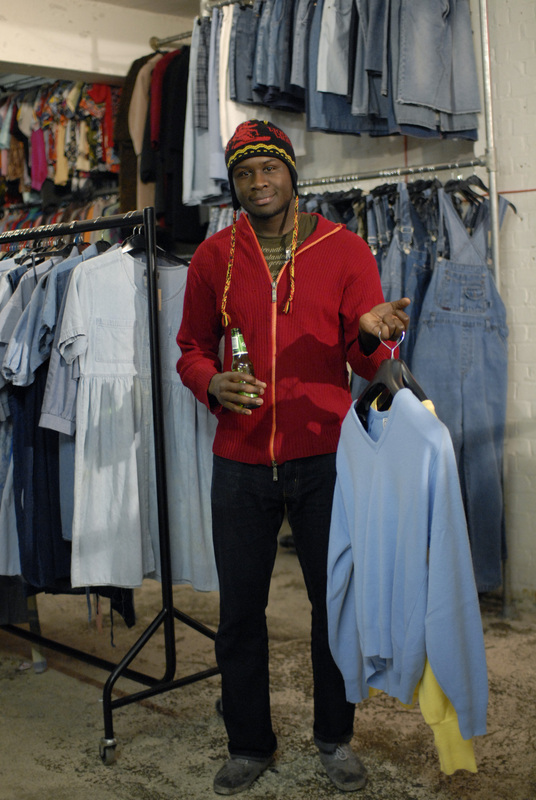 This is Robson, an artist and curator, looking for an outfit for the opening of his show on Thursday. 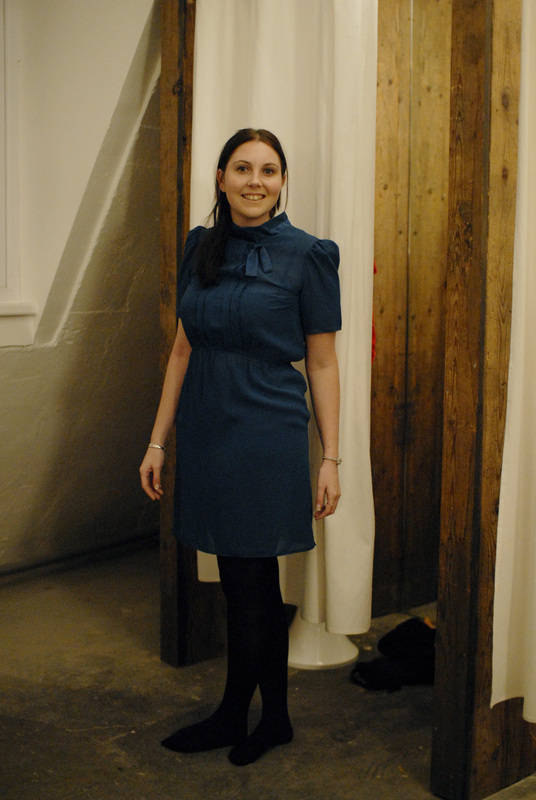 Emma is deliberating between a red dress and this one in deep turquoise for £30. Max has just moved to London from Weymouth and is considering investing in a leather jacket, maybe. Lovely warm words as always, and great photos. I wonder why it was decided to adopt the US name of thrift shop, although I do like the way it has become a verb… going thrifting… I rather like that. In the old days here in the UK they just used to be called secondhand or junk shops. I miss the times when I was a teenager living in rural Buckinghamshire and you could go to three or four different village jumble sales every Saturday… each one stuffed with *real* treasures – Victorian lace nighties, 1950s frocks, Clarice Cliff china – and nothing more than 50p. 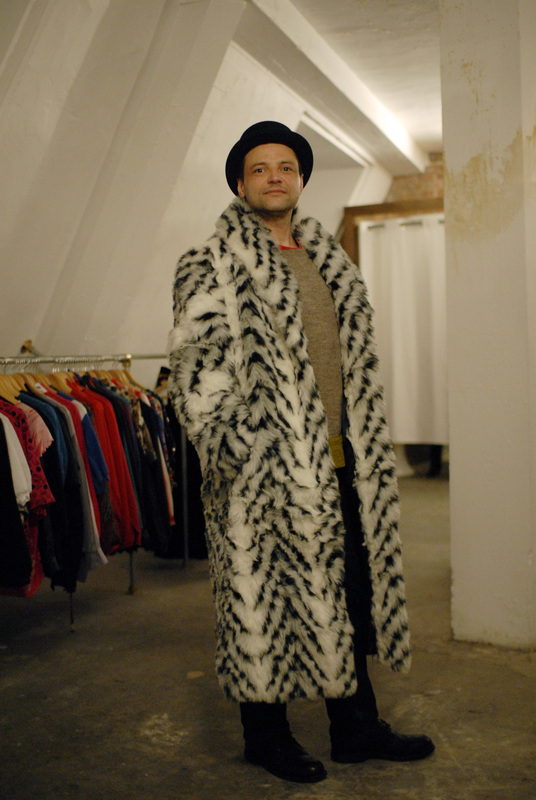 Lovely to see so many having fun with thrift shop clothes. At age 62 I have been wearing attic and thrift shop clothing since I was old enough to dress myself. Most recently I had my grandfather’s Harris tweed overcoat from the 1930s remade into a shorter walking coat for myself. I love feeling the link to my long-dead grandfather (who was a textile designer in New England’s long-defunct woolen industry) and even to the craftsmen who spun, dyed and wove the fabric. An extra bonus was working with a charming Italian tailor now retired to Maine. Clothing with meaning! I hoope Poppy bought the hat — it’s fabulous. This looks like great fun!! I just want to say, thankyou so much for writing such a lovely piece about us, I am the wife of Myles Oakley (the owner of The East End Thrift store). The work he and his team put into the events is quite outstanding, it is great to read such a positive things, I will make sure it is the first thing he sees when he gets home. I think there is something about the word ‘vintage’ that conjures up a different world. A world where interesting people go about their lives dressed in wonderful fabrics and well tailored clothes that have been’ previously cherished’. Whatever words we use to describe this fun activity it means less landfill and less money going into the pockets of large businesses who all want us to look the same.